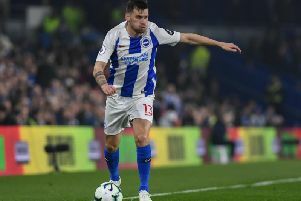 Goalkeeper Mathew Ryan said Brighton & Hove Albion's 1-1 Premier League draw with Arsenal felt like two points dropped this evening. The Gunners took the lead through Pierre-Emerick Aubameyang after seven minutes and the Gabon striker was denied by two excellent Ryan saves before and after the goal. Jurgen Locadia equalised on 35 minutes, before Albion finished the game on top but were unable to find a winner in the second half. Speaking to Sky Sports afterwards, Ryan said: "We're disappointed we didn't start too well. We knew them wanting to get in behind was one of their main strengths and we allowed it too easily at the beginning. "But we've shown our character and luckily Jurgen was atent to the situation to get us back into the game. "I feel they were there for the taking. When we put them under pressure in the right moments, there were a few frailties. "At home, it's two points dropped. That's how I feel."